Carex laxiflora.© Gary P. Fleming. 2014. Virginia Botanical Associates, Blacksburg. Digital Atlas of the Virginia.Flora.vaplantatlas.org (Accessed 4/2014). Carex laxiflora is a perennial sedge, tufted, to 70 cm tall, often pale, waxy-green, fertile stems erect or ascending, 3-sided, sometimes narrowly winged, basal sheaths pale brown. 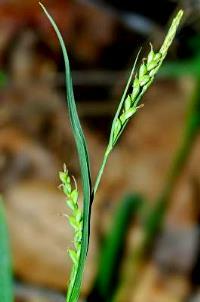 Leaves of sterile shoots to 2.5 cm wide, leaves of fertile stems narrower, to 0.8 cm wide. Flowers monoecious; male (staminate) spike at top of stem, to 2.5 cm long, stalk to 2 cm, female spikes 2-4, scattered, closer near top of stem, 1-3 cm long, 0.2-0.3 cm wide, stalked, no basal spikes, lower scales pointed to short-awned, perigynia hardly overlapping, 5-15, about 0.3 cm long, bluntly triangular, tip tapered to a small beak, tip slightly bent over, opening without teeth, achene 3-sided, on spongy short stalk in base of perigynium; inflorescence bracts to 1 cm wide, upper bracts often longer than inflorescence, bracts with sheaths; blooms May-June. Habitat: Moist to dry, rich woods.